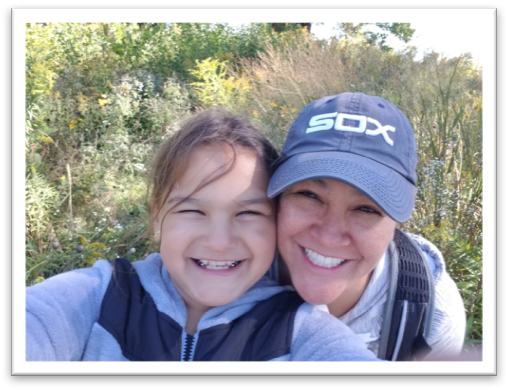 “We travel far north and we travel far south…” Marcy Juarez and her daughter, Ryann Stahulak have marked several boxes off their Honeycomb volunteer checklist and they are just getting started. You name it, they’ve been there…cleaned a city beach, ran basketball drills at Shirley Ryan AbilityLab, built bookcases for schools, celebrated local heroes, maintained a school garden, sewed quilts, baked cookies, explored a prairie wetland—together they have participated in more than 20 projects. Growing up in the south suburbs, Marcy volunteered regularly. Whether it was through grade or high school or pitching in when she was older at the Chicago Marathon or the Ronald McDonald House, she knew this trait was going to be passed down to her daughter. “I came across Honeycomb over three years ago,” said Marcy, “we were volunteering at school but we wanted more.” “One of the first projects we did was making cards and goody boxes for fire fighters. Ryann loved visiting the fire houses to drop off the packages afterwards.” Volunteering takes precedence in their household and the family is thankful that Honeycomb provides this opportunity and opens their eyes to communities outside of their own and to nonprofit organizations they were not familiar with. “We always try something new at Honeycomb,” says Marcy. “Ryann and I travel far north and we travel far south for the volunteer projects.” She continues, “some of our favorites are making sleeping mats out of plastic bags for the homeless and also projects working with animals-Ryann is an animal lover.” “We also enjoy being outside and working on the beaches. It’s great to see the results of getting garbage off the beach and to learn about water pollution.” “Just by getting out there and reaching out to others…” stresses Marcy, “…every bit helps.” “I feel getting kids started a young age will help transpire that idea of giving back through the middle school and high school years.” Outside of Honeycomb, the Juarez-Stahulak Family loves to spend time outdoors and explore neighbourhood parks. Marcy works in property management and Ryann enjoys arts and crafts, especially finding new slime recipes.